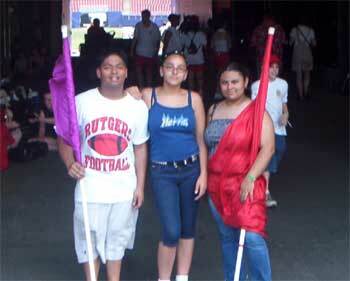 Marc Paulo Guzman writes: "This is a picture of me (Marc Paulo Guzman, Quest guard member, left), Carly Steif (Quest mellophone, center) and Jessica Bermudez (Quest baritone, right) at Giants Stadium for the "Music is Cool -- the Big Apple" clinic. There we, along with several Quest members and some of my own marching band friends, got to spend a day with the Cadets. We got to spin, play music, toss, talk and become friends with the Cadets. "Although we come from two different corps, there is no competition. We are fans of each other and we love what we do. During the guard clinic, Jessica and I learned some of the flag work that the Cadets do in the "Fanfare and Allegro" part of their 2003 show. Also, I learned the rifle part and Jessica learned the dance part to "Malaguena." It was a great day, and the show that night was awesome. It was truly an amazing experience to work with other corps members and learn of their traditions and many of their different behind-the-scenes activities." Thanks Marc Paulo! E-mail your Forzato submissions -- and we will get to them all, in time -- to dave@dci.org along with where and when the photo was taken. Send some biographical information about yourself as well. We'll give you full credit. Also, let us know if you want your e-mail address included, to get feedback from other drum corps fans.